Esgos is quite close to the town of Xunqueira de Espadanedo. 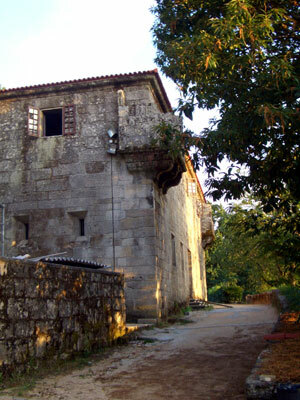 It sits just off the OU-536 highway leading to Ourense. We decided to take a look at Esgos on route back from Ourense when we noted that it had what appeared to be a large monastery close by. The town is small and has a church with the main council offices a few metres below it. 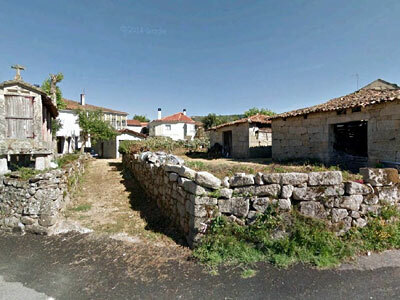 There are also a couple of typical Galician style houses, plus a small town square with a sculpture and a fountain. The monastery however is nowhere to be seen. Right, this is the small village of Esgos and it straddles the OU-536 highway. 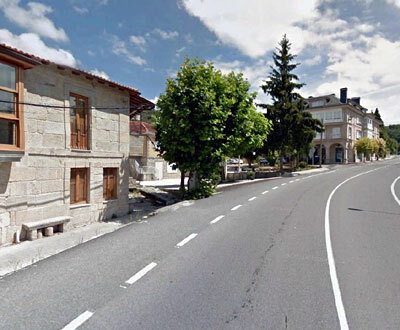 It is one of many small hamlets that you encounter on this (and most other) roads in Galicia. The monastery (called Monasterio de San Pedro de Rocas, Esgos, Ourense) is actually signposted a further couple of kilometres down the OU-536 and reaching it involves a winding journey of 5 minutes or so up into the hills. 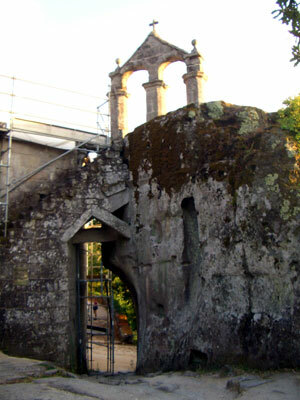 On route you pass a stone pazo (manor house) before arriving at the monastery a short distance away. The route is simple and the building is easy to find. Left, this is a photo of Monasterio de San Pedro de Rocas close to Esgos. We arrived quite late in the day and there was only one other visitor to the site. My guess would be that this monastery, although small, would be well worth a visit now that it is (I assume) completed. At the time of our visit (summer 2006) there was very little to see as our photos testify, but significant restoration work was being undertaken on this building and plaques with tourist information (also in English) were been added to it. There was also a stone visitor information cabin and a car park and we were left with the distinct impression that, both inside and out, this structure would be a worthwhile tourist attraction in the near future. What information we could establish about the building suggested that the oldest parts of the monastery dated back to 573 AD and that the building had some ancient and original troglodite chapels. No doubt more information will have become available since the completion of the renovation work. Part of the monastery is cut back into bare rock and new steel walkways were visible inside the building. We concluded that it may well be worth a visit once it is completed, probably in 2007. Right, this is the bell tower of the structure. Below, another view of the village of Esgos, before you get to the monastery a couple of kilometres away.